Combination products are clearly defined in 21 CFR 3.2(e), and the Office of Combination Products has a charter in place. Various offices within the FDA have identified combination treatments, therapies, and regimens in recent approvals.1 Strictly speaking, these approvals are not combination products because they are drug/drug or biologic/biologic combinations that — when combined — aid in the treatment of specific indications. From a regulatory standpoint, there may be instances where combination treatments fit in with combination products. However, unless the therapies meet the criteria identified in 21 CFR 3.2(e), the treatment is not a combination product in the eyes of the agency. any investigational drug, device, or biological product packaged separately that, according to its proposed labeling, is for use only with another individually specified investigational drug, device, or biological product where both are required to achieve the intended use, indication, or effect. for which preliminary clinical evidence indicates the drug may demonstrate substantial improvement over existing therapies on one or more clinically significant endpoints, such as substantial effects observed early in clinical trials development. The FDA will expedite the development and review of a drug designated as breakthrough therapy. This means all requests for breakthrough therapy designation will be reviewed within 60 days of receipt, and the FDA will either grant or deny the request. Since the FDASIA was instituted, an increase in requesting breakthrough therapy designation has erupted, especially in the FDA’s Center for Drug Evaluation and Research (CDER). Breakthrough therapy designation requests received by the CDER continue to increase over time, whereas the CBER numbers’ rise is slower and steadier, as shown in the tables below. 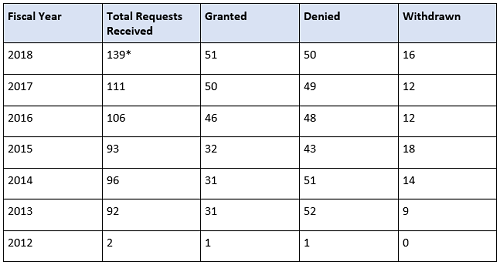 * Requests that are still pending a decision are included in the Total Requests Received column. * Requests that are still pending a decision are included in the Total Requests Received column. Withdrawn applications are counted in received total (for CBER). Although the breakthrough therapy designation track may appear to be faster, there are considerations an early-phase program must make. A breakthrough therapy designation conveys all of the fast-track program features, more intensive FDA guidance on an efficient drug development program, an organizational commitment involving senior managers, and eligibility for rolling review and priority review. Several notable recent “combination therapy” approvals from the CBER include drugs for patients at the end of current beneficial doses. On February 26, 2018, the FDA approved abemaciclib (Verzenio) in combination with an aromatase inhibitor as initial endocrine-based therapy for postmenopausal women with hormone receptor-positive, human epidermal growth factor receptor 2-negative advanced or metastatic breast cancer. On May 3, 2018, Andexxa was approved. This is indicated for patients treated with rivaroxaban and apixaban, when reversal of anticoagulation is needed due to life-threatening or uncontrolled bleeding. Another use of the identifier combination, which is outside the combination product sector and a part of the government’s response to the opioid epidemic, is the medication-assisted treatment (MAT). MAT is defined as the use of medications in combination with counseling and behavioral therapeutics which is effective in the treatment of opioid use disorders and can help some people sustain recovery. MAT3 falls under the Substance Abuse and Mental Health Services Administration. Three drugs have been approved by the FDA for the treatment of opioid dependence: buprenorphine, methadone, and naltrexone. All three of these treatments have been demonstrated to be safe and effective in combination with counseling and psychosocial support. 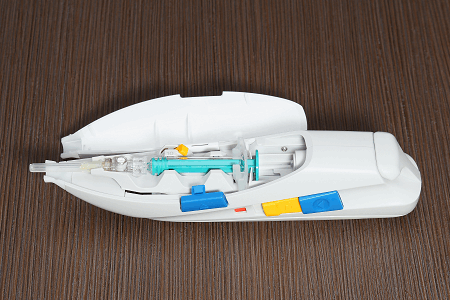 As technology advances and experimentation with existing approved entities broadens, providing safe and longer-lasting options for patients will become a primary goal for all future product development. The use of “combination” will continue, and the proper use of it will depend on regulatory professionals reminding development teams of the differences as data becomes available. Strategic planning begins when management positions a concept, and the pathways the resulting search may take will depend on your regulatory questioning and innovative directions. March 6, 2018: Trogarzo (ibalizumab-uiyk), a new type of antiretroviral medication for adult patients living with HIV who have tried multiple HIV medications in the past (heavily treatment-experienced) and whose HIV infections cannot be successfully treated with other currently available therapies (multi-drug resistant HIV, or MDR HIV). Oct. 18, 2018, New England Journal of Medicine; Steven Rowe, M.D., M.S.P.H., director, Gregory Fleming James Cystic Fibrosis Research Center, University of Alabama at Birmingham; Michael Boyle, M.D., senior vice president, therapeutics, Cystic Fibrosis Foundation, Bethesda, Md. Lynn C. Hansen, RAC, director of regulatory affairs, Pharmatech Associates, has worked in the development and regulatory management of product programs within the pharmaceutical and bioscience industries for 30 years. Her experience spans the drug development lifecycle from product development and research through to commercial launch and post-market monitoring for solid dose, parenteral, and combination products. She has held leadership positions in both Big Pharma and virtual start-up organizations, overseeing the regulatory submission and maintenance programs for multiple products. Hansen’s expertise includes CMC, clinical, and non-clinical modules and extends to both U.S. and global regulatory filings that utilize the eCTD format. She is an active member of the Regulatory Affairs Professional Society certification program and currently sits on the Regulatory Affairs Certification Board.